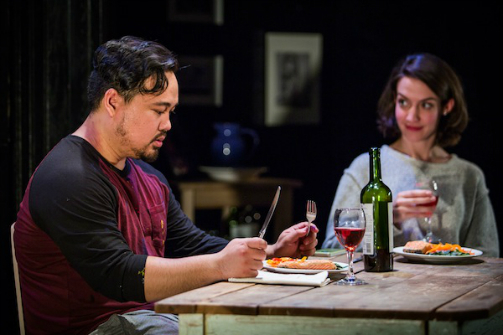 Ivan Dolido and Marlowe Holden in The Feast. Photo by Bjorn Bolinder. BOTTOM LINE: An artist goes crazy as he hears screams from the toilet. Toilets can be frightening. They connect to the sewers, and who knows what is down there. Perhaps it is just in his mind, but Matt (Ivan Dolido) is finding it difficult to distinguish what is or is not reality. The Feast's strange world, created by writer Cory Finley, is described as “an eerie comedy” despite giving me nightmares. I feel like it is more accurately in the realm of thrillers. Don't get me wrong, there were plenty of amusing moments, but my overall takeaway was that it was scary, yet thought-provoking. “Tonight is the Feast” and we have no clue what is in the food we're eating. Matt is an artist. As we all know, this is a difficult profession, and relationships can certainly impact one's career path. In Matt's case, he is with Anna (Marlowe Holden), a brusque consultant who is planning a work trip that may or may not be what she says it is. Due to an inappropriate relationship with a coworker, Anna is debating leaving Matt. As he struggles to reconnect with her, Matt suffers mentally. He hears screams from the toilet. There are creatures from the sewers that invite him to a feast. The creatures pop up in conversations with others and throw Matt into a frenzy. Is he hallucinating? Is he sane? At least he is creating an impressive painting, however strange it may be. Then tension starts to mount. A storm is on its way and Anna is staying at her mother's house. Her return marks a night few will forget. The culmination of events had me squeezing my friend's arm. As Matt's cornucopia of issues unfolds he interacts with a plumber, a therapist, a friend...and each of these random characters is played by Donaldo Prescod. Prescod is like a chameleon with the varying personalities, his energy infusing each of his scenes with a natural invigorating momentum. But my favorite moment involved Matt, a painting on the fourth wall, and a knife. Dolido's mental journey throughout the scene was plastered on his face and really freaked me out in a good way. The psychological aspects of the show really drew me in, but if you do not like being scared, or at least a little freaked out, be warned: this is not a happy-go-lucky show. It is dark and brooding, with funny moments spliced into the weirdness.